Well, what do you know? When it isn’t a slice-of-life anime, I can actually enjoy something by P.A. Works. The slick mecha action kinda helps, too.Honestly, I’m pretty neutral with regards to mecha series in general. If they do err, it’s usually when the writers bog down the narrative with excessive jargon or world-building. Excessive is the key word. Yes, we need to set the stage, and sometimes, clever use of jargon can add a certain flair to a story. It doesn’t help, however, when I have to sit through half an episode of technical terms and clunky exposition just to get the story started. Luckily, I haven’t gotten any of that here. There’s some jargon, and we still have those obligatory control room scenes, but the action stays brisk and light on its feet. Mecha series can also misstep when they fall in love with themselves too much. 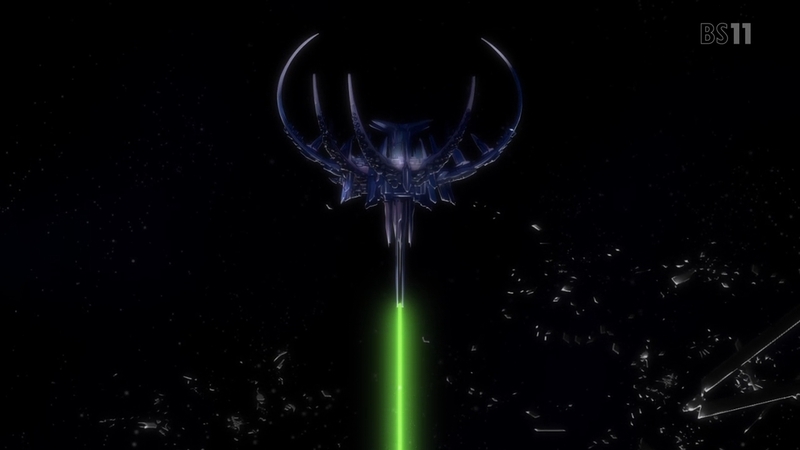 I groan when I have to watch the camera lovingly pan across a mecha as the bipedal weapon readies itself for battle for the umpteenth time in the umpteenth conflict of the series. I’m looking at you, Captain Earth. It’s almost fetishistic in a way. 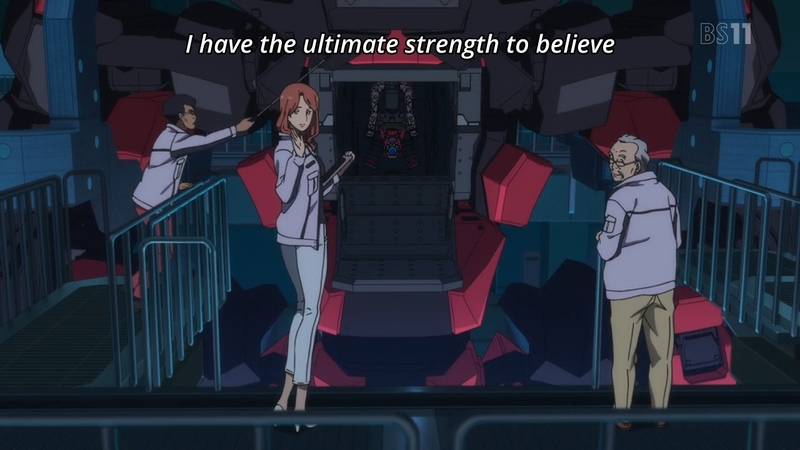 Beyond these problems, mecha series are otherwise safe, formulaic shows by virtue of the fact that these shows are usually accompanied by a huge push to sell toys and other mecha-related merchandise. I don’t know if that’s the case here, but it doesn’t matter. 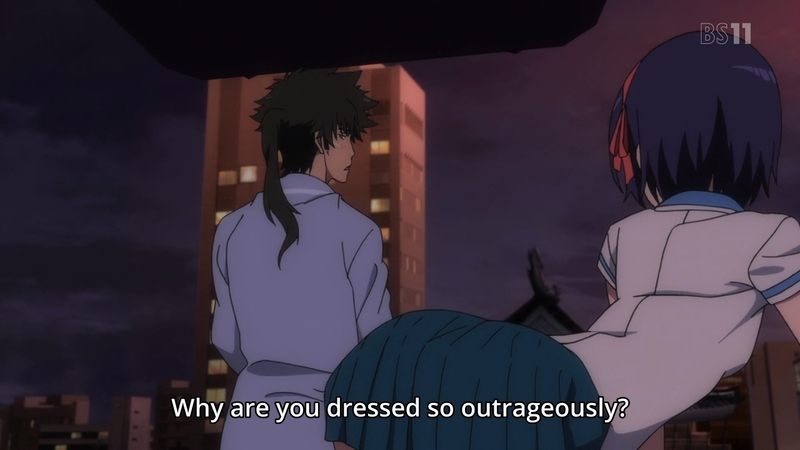 I’m enjoying Kuromukuro more than I ever expected to. I’ve actually found myself laughing several times as our Encino Man tries to acclimate himself to modern Japan and its culture. I also don’t actually cringe when the characters interact. But I’m getting ahead of myself; let’s introduce the story first. 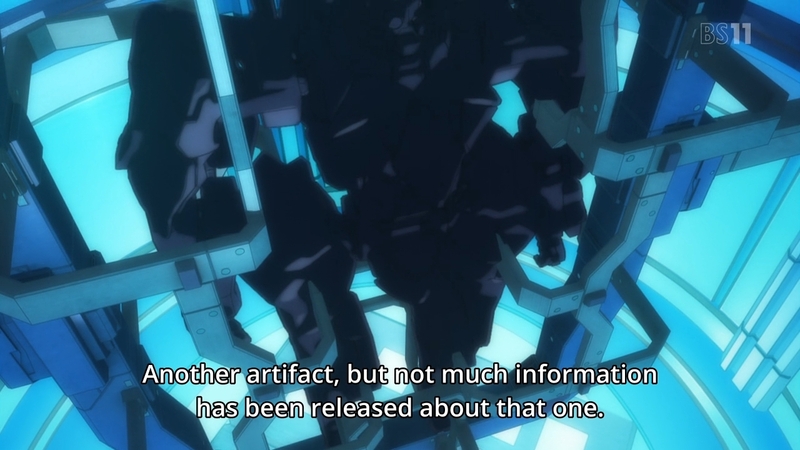 At some point in our alternate universe, Japan unearthed two bizarre artifacts: a black, towering mecha and a black cube to boot. As you can imagine, Japan and the UN have been studying both relics closely. 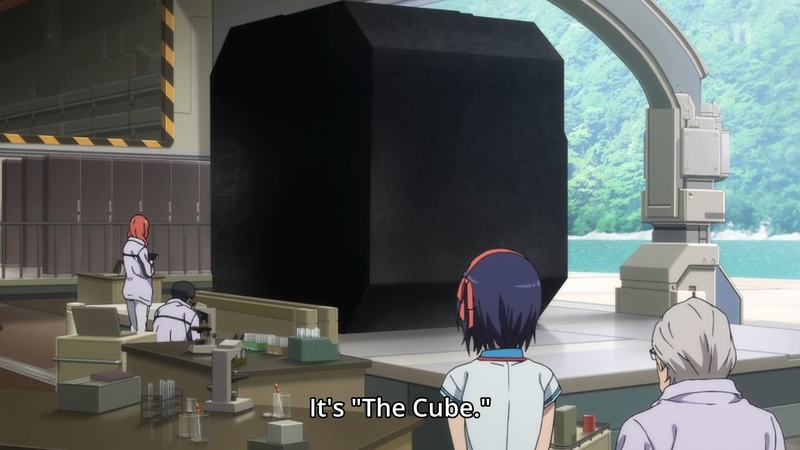 UN scientists have naturally managed to develop mechas of their own — it is a mecha show, after all — but the black cube has remained a mystery until now. When strange mechas rain down from space, our hero Kennosuke suddenly emerges buck naked from his cube prison, and immediately goes to battle against those our alien invaders. The only peculiar thing is that he refers to them as demons. And oh yeah, he seems to have been stuck in cryostasis for the past 450 years. Anyways, Kennosuke is a stereotype, sure — and by that, I mean a stereotype of how a samurai is supposed to act — but he isn’t the same boring mecha hero that I’ve been forced to root for over and over. For now, the novelty is amusing, especially as I watch the guy struggle with everyday things that we take for granted, e.g. curry, boxers, TV broadcasts, etc. There’s more to come, I’m sure. After all, slice-of-life seems to be P.A. Works forte, but I might be able to endure it this time around. Even better, we are introduced to Yukina before Kennosuke. As a result, we get to learn about the girl and the girl specifically. This is important because her existence and her motivations are not dependent on the male hero. She is oddly obsessed with geological features like rivers, canals and terraces. The girl coos with delight when she gets to see a massive dam near her mom’s workplace. 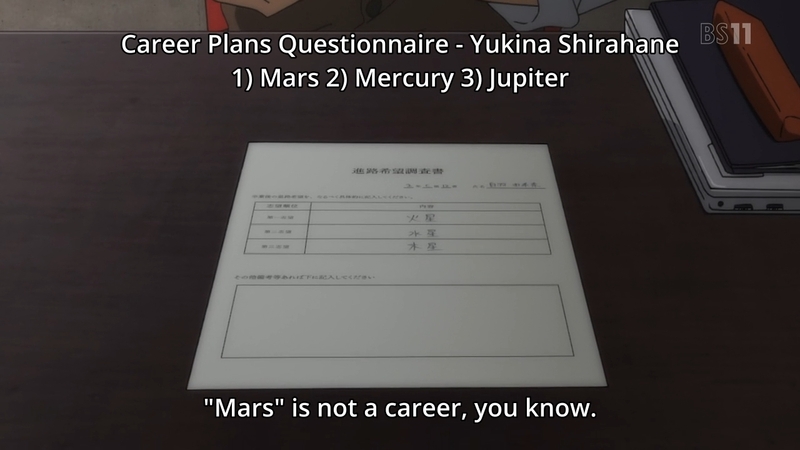 To top it all off, Yukina dreams of traveling to Mars one day. She yearns for it so much that she writes it down as one of her career goals. The other choices on Yukina’s list? Other planets in the solar system. Unfortunately, her grades aren’t quite where they should be, but it’s clear that she’s been forced to live within her mother Hirome’s huge shadow. This must be doubly frustrating for the girl since she feels a bit neglected by her mother. Hirome is a well-respected researcher and scientist, so people seem to have high expectations of Yukina as well. Unfortunately, part of being a well-respected researcher and scientist is that her mother can’t be around as much as either of them might like. This isn’t an indictment on career women; it’s just a reality. If you’re going to be at the top of any field, something will have to suffer as a result. With Yukina’s father disappearing to god knows where, it didn’t help that Hirome wasn’t around either. But who knows? Maybe her father’s disappearance was harder on Hirome than Yukina really knows. And even if that isn’t the case, it’s not as if Hirome is a cold woman. We’re not talking about Shinji’s father or anything. God no. The matriarch of the family still very much cares for and worries about her two daughters. She’s just a bit neglectful because she has so much on her plate. As a teenager about to enter adulthood, Yukina is understandably frustrated about it now. But once she embarks on her own career and starts thinking about forming her own family, she might look back and appreciate just how hard it was for her mother to strike the delicate balance between the two. This is true for anyone, man or woman. Nevertheless, Hirome is at the top of her field, and her two daughters are healthy, well-educated, and in good health. If anything, she’s doing a pretty good job. The script has actually been flipped as Hirome’s brother Yakushi is the one who “stays home” in order to raise the kids. 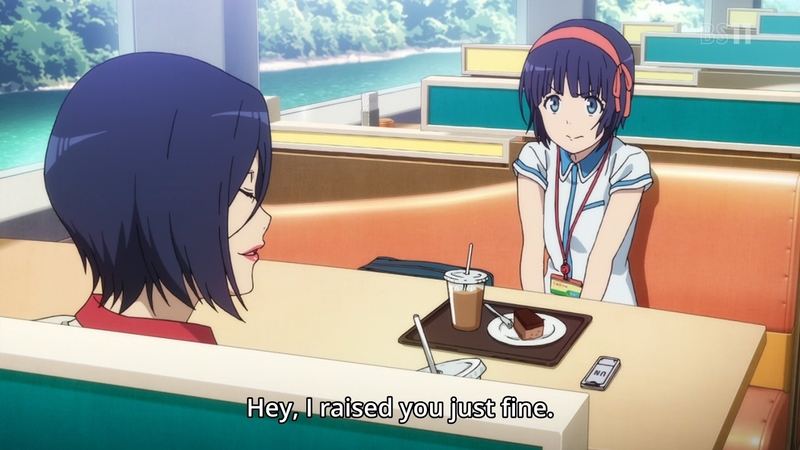 So we accomplish two things here: Kuromukuro preserves the importance of family, but at the same time, it doesn’t enforce antiquated gender roles. In the end, we have, I feel, two pretty strongly defined female characters in Yukina and Hirome. So where is Yukina’s dad anyway? It’s one of those mecha mysteries. 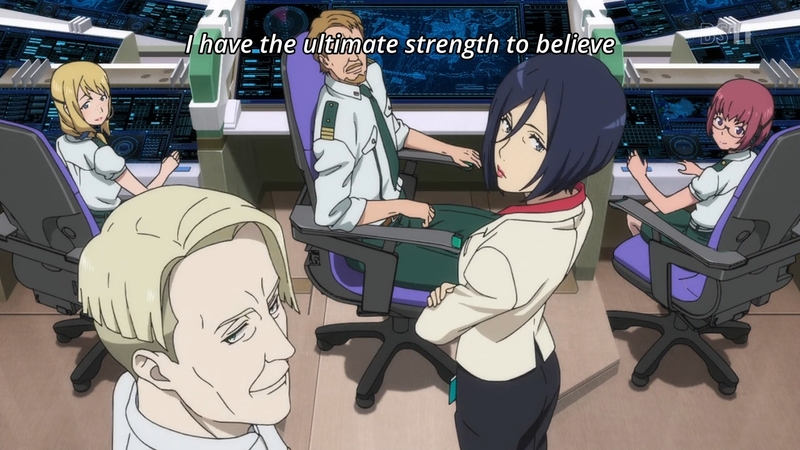 One or both of the parents are always missing at the start of the story, and Kuromukuro is no different. On a related note, I’m always amused by how mecha series will also double as a mystery series of sort. Everything is shrouded in the unknown. Bizarre invaders from space? Check. Age-old relics unearthed from the ground? Yep, got that too. One’s parent disappearing without a trace? God, Renton can tell all about that. And Yukina as well, apparently. The point is, we know relatively nothing about the overall arch of the narrative at the moment. Why were there mechas as far back as 450 years in the past? How did some Sengoku-era princess manage to sacrifice herself and therefore drive back these hostile invaders? Why have they now returned and from the ISS of all places? 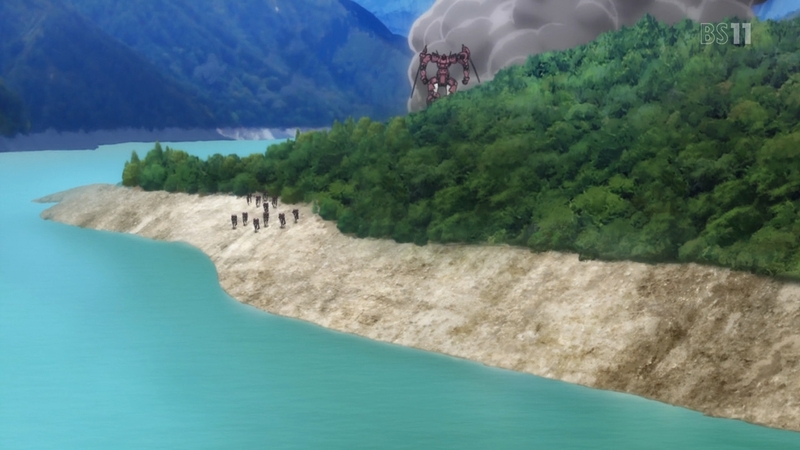 Who’s controlling these unmanned mechas and what are they looking for? What’s pulling these aliens back into space once they’ve been defeated? So many questions to answer, but that’s the way of the mecha anime. At least we don’t have very important people in very dark rooms discussing very important matters in very vague ways. In time, all of our questions will be answered. I’m just thankful that we have so far managed to avoid that terrible trope. When the action does kick in, P.A. Works technical acumen does the trick. The animation is clean, and battles aren’t a kinetic mess of flying, metallic parts. If our combatants’ movements tell a story all on their own, then we have a competent one here. And outside of the battles, Kuromukuro looks pretty good. In general, anything by P.A. Works tends to look “pretty good.” If there’s any criticism, it’s that their shows can also tend to look a bit sterile. The studio won’t commit any great animating sins, there always seems to be something missing. A certain je ne sais quoi. Take this shot, for instance. Can I say anything negative about it? No, but at the same time, it leaves me a bit cold. It’s so ordinary in its perfection. “Well, that’s not fair,” you might say, “This isn’t a very important scene.” Then take this shot. 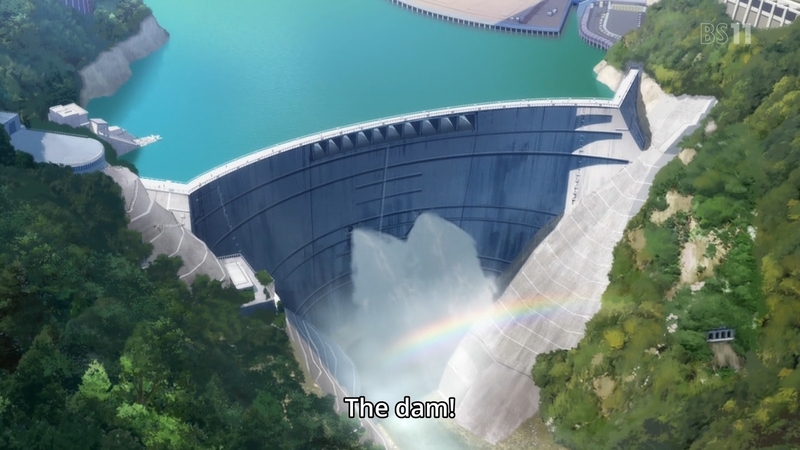 The dam is majestic in Yukina’s eyes, and from her ground perspective, it probably is. But this sense of greatness isn’t properly conveyed to the audience. The shot is competently composed, but only that. Nothing is wrong with it per se, but it doesn’t quite strike the chord that puts us in Yukina’s shoes. And here, we have the encroaching threat of our unknown invaders, but again, I’m unmoved. It feels like a perspective from a video game than something truly frightening. 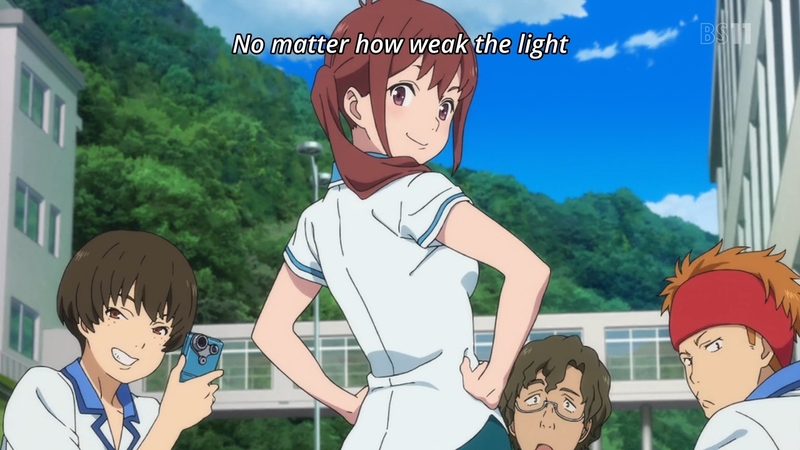 Still, if that’s the only negative thing I can really level at Kuromukuro, then that’s not all that bad, is it? And for now, at least, Kuromukuro’s not bad at all. Even if I don’t care all that much for mecha, the action scratches a certain itch. I get plenty of zombie killing action in Kabaneri of the Iron Fortress, but sometimes you want something a little less weighty, and frankly, a little less depressing. In that regard, Kuromukuro steps ably up to the plate. And even if its visuals doesn’t tickle the imagination, there’s at least a lot of heart in the characters themselves. And from what I can gather, isn’t that what P.A. Works is generally good at? For once, I don’t have to wade through a slice-of-life anime to enjoy their expertise. I’d love to see how it all plays out for Yukina and her samurai friend from the past. There’s a funny moment when our hero learns that Yukina is still unmarried. After all, in his world, girls are married off quite early in their lives. He thus remarks that no one has volunteered to tame the shrew, but ironically, he’s the one that needs to be tamed. This is just another example of the script being flipped as age-old traditions give way to modern sensibilities. 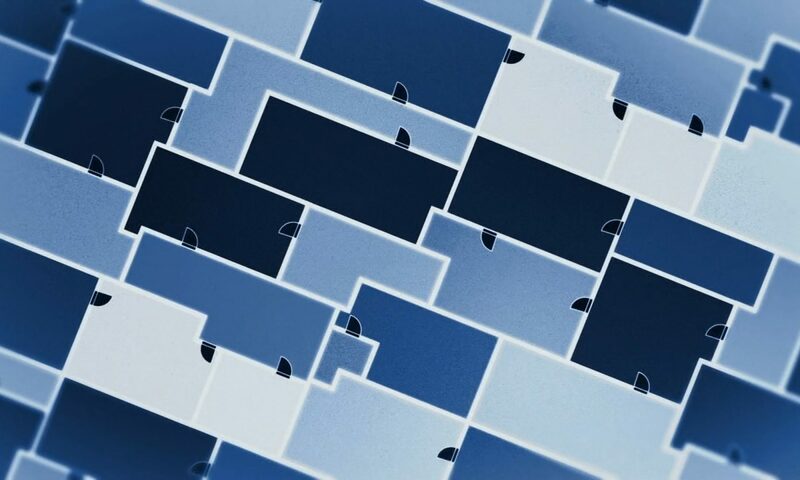 But of course, just because something’s modern doesn’t mean it’s ideal, and we’ll see plenty of this too, I’m sure. In any case, I’ve finally found another show to look forward to every week. 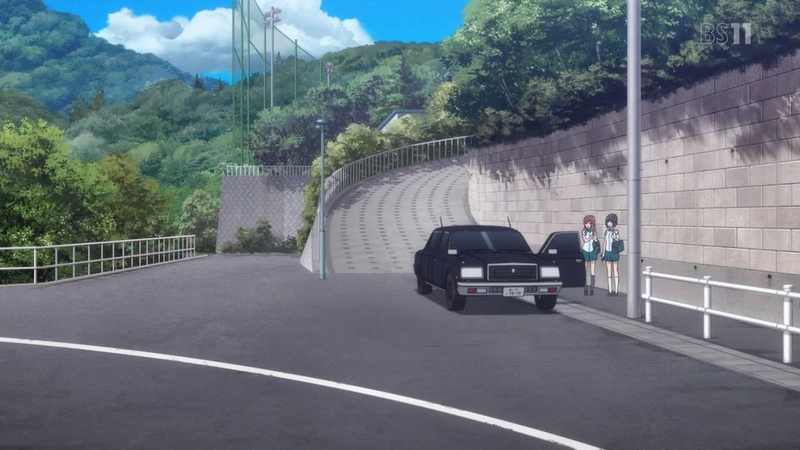 As an aside, the side characters sure do looking back at the camera…. Kuromukuro is not the greatest anime ever nor it is particularly fresh, but it is extremely well-executed. This quality is pretty rare in anime, for some reasons. I have a good time, so it’s ok. Amazingly, people actually complained about the lack of exposition. The anime community has changed. If it was 10-15 years ago, people would be circle jerking over this series, not Re Zero. PA works specialize in slice of life, so I didn’t expect impactful shot. The very nature of slice of life genre means that there must not be any truly “out there” stuff. Those shows focus on small details and interaction. BTW, will you watch Macross Delta as well? The first ep was a bit chaotic, but things calmed down quickly. Those shows focus on small details and interaction. None of the shots I criticize focus on small details, though. They’re just boringly composed shots. The singing is a turnoff. 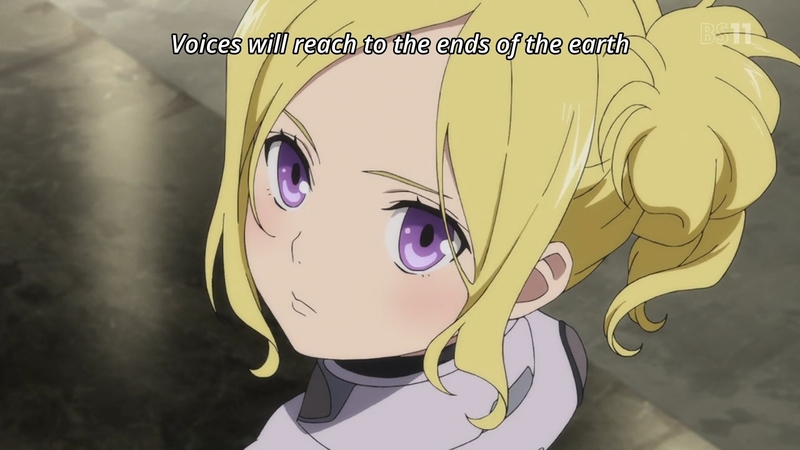 I’m also enjoying the series more than i expected and as someone who loves a god bgm, this show is great. Sawano is working kabaneri but I’m yet to hear any thing of high caliber but this has beautiful tracks in every episode. The characters are good too even if yukina does annoy me at times. Especially in the first episode, she just seemed so absent minded like she isn’t processing how serious the situation is. I like the little sister too. By making her feel like and actual fun loving kid she’s cute. I wish other writers would take note, instead of going the sickly, or overly cute imouto route. Especially in the first episode, she just seemed so absent minded like she isn’t processing how serious the situation is. Well, would you believe what you were seeing if you were in her shoes? Wow, for once I completely disagree. Tari Tari is the greatest thing PA Works has ever produced, man. And this series, not so good. Ronin-san gives me awful flashbacks to TTGL, and its inexplicable belief that screaming morons are not repulsive much less attractive. Well, we can agree to disagree.